This is the sixth installment in a continuing series calling out songs that should be in every horror fan’s running (or exercise) playlist. For this installment, it’s about DEATH — that final oblivion and what lies beyond. I just finished the Rock and Roll Half Marathon here in St. Louis, so running playlists are TOP of mind for me and I felt it was time for another post in this series. These are definitely tempo songs. For these additions to the playlist, I’ve attempted to follow in some way the storybook process of dying here — death, haunting / passage and the beyond. STEP ONE — DEATH — Poet, artist and “Basketball Diaries” author Jim Carroll and his band give us this incredible punk ode to his fallen comrades. This still sounds as fresh as the day it was recorded. AWESOME for pace. So many people dead, so much love. A HUGE RIP to Jim Carroll himself as well. STEP TWO — HAUNTING / PASSAGE — I absolutely love these guys and this album was a TOTAL monster. Annnnd… This song was among the best on the album and was one of the best songs of 2007, IMHO. Haunting, bittersweet and driven, this one will drive you through the miles. STEP THREE — THE BEYOND — One from the great Jeff Buckley. The man was simply taken from us FAR too soon. Perhaps this is a perfect artist and metaphor to represent the final step in this list, for it is through his art, through masterful songs like this one, that Buckley found a true measure of “Eternal Life.” This is a full-on rocker with more punk rumble, reckless abandon and virtuosic punch than you can shake a stick at. Drive that tempo for this one, too. Hard. Feel those chills. OK… So this one’s a weird one, but I felt it belonged here. Last week, I was at an event at the 27,000 square foot former Mandrell estate, neé Fontanel, outside of Nashville. (Don’t ask.) It was a fascinating location and the peek inside the life of the ever-super-gorgeous and über-talented Barbara Mandrell and her beautiful family was nothing short of captivating. Much of that peek inside was through the myriad family photos throughout the mansion. Really, in many ways, they were photos of life like any of us would have. Perhaps that was the most interesting part — the relatable nature of so many of them. Now that’s just awesome to see. How about that Drac tux? Annnd, especially big ups to the truly unnerving Jaime (if I’m not mistaken — am I?) and the extra creepiness that comes from youth in this type of costume. You’ve gotta love a family that embraces the horrors of Halloween! Welcome to Part IV of my tribute to hollywood (and hollywood horror) legend Roger Corman. I am creating an 8 poster series in tribute to Corman’s early-1960’s “Poe Cycle,” where he brought classic stories from the EA Poe cannon to film. You can read Part I here, with my actual article on Corman and view Posters I and II there as well. Part II can be found here. And… Part III is here. ANNND… Part IV is here. This poster completes the full tribute to Mr. Corman’s “Poe Cycle.” Again, a big THANK YOU to Mr. Corman for all he has done for film and horror-lovers everywhere. The team on this parody trailer have had some real fun. The playful skewering of all-too-familiar horror tropes shows both love for the genre and makes us all laugh as we all know this is how things would be when things went awry with even a modicum of sensibility in the mix. Enjoy! 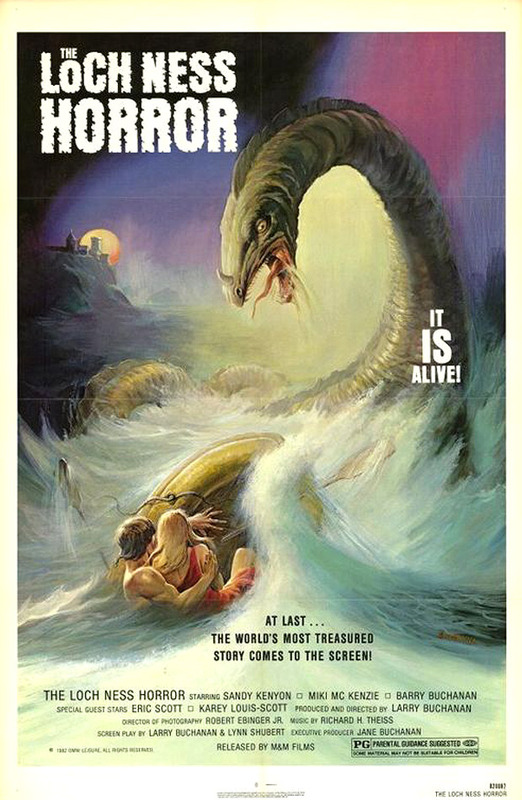 Welcome to Part IV of my tribute to hollywood (and hollywood horror) legend Roger Corman. I am creating an 8 poster series in tribute to Corman’s early-1960’s “Poe Cycle,” where he brought classic stories from the EA Poe cannon to film. You can read Part I here, with my actual article on Corman and view Posters I and II there as well. Part II can be found here. ANNND… Part III is here. With this post, I also wanted to share this amazing illustration from 1919 capturing the Poe story that the above film was based on. 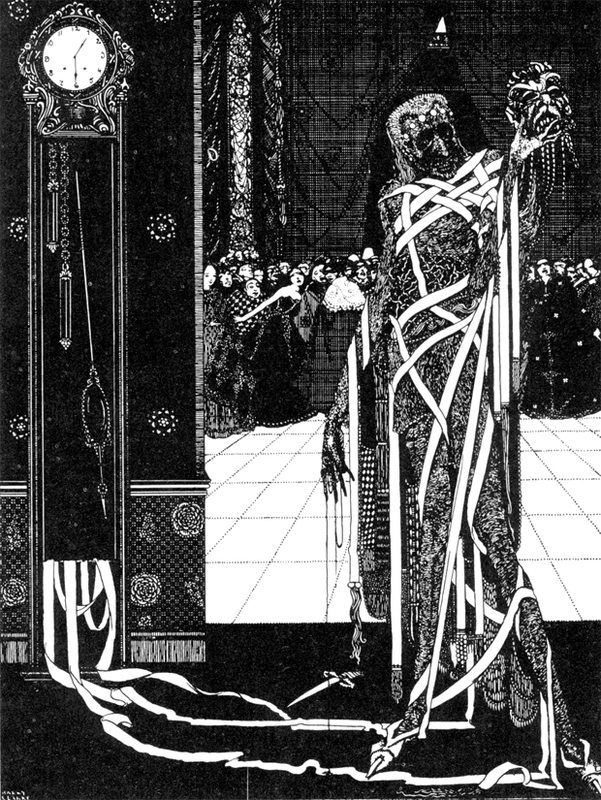 The artist is the great Harry Clarke. I’ll be featuring his horror work in an upcoming post. Stunning stuff. I fear posting it with my work is a huge mistake as my work pales so much in comparison. HOWEVER, it’s a nice juxtaposition. Just one poster away from completing the full tribute to Mr. Corman’s “Poe Cycle.” Look for the final installment coming up. ART :: ONE FOOT IN THE GRAVEYARD… CELEBRATE OCTOBER! Last year, I celebrated this, the spookiest of seasons, with a 31 day art project called “One Foot in the Graveyard.” Really, the tagline says it all: “31 DAYS, 31 WALLPAPERS, ONE SCARY SEASON.” The goal was to give my fellow denizens of the dark something new each day to bring a touch of this most horrific time of year to their work-a-day lives. The site turned out to be something pretty cool, too. It’s really worth checking the whole deal out at the site. It was a very fun thing to do and you can download your faves and change up your desktop daily. Join me! Celebrate October! Author David Edward JohnsonPosted on October 8, 2013 October 8, 2013 Categories Art, FunLeave a comment on ART :: ONE FOOT IN THE GRAVEYARD… CELEBRATE OCTOBER! I continue to have internet issues, but I’m trying to get back on track here. I’ll tell you, data connectivity is a racket. Ben Howling and Yolanda Ramke have done something really notable with these 7 minutes — they have created real emotional resonance in not only a short-format piece, but also with a zombie infection story. Their approach transforms the film from something that is very expected into a piece that is truly memorable with a universal message of unconditional love. AND, I love the way it’s shot. Very nice choices all the way around. Enjoy!